Christmas in Jamaica before emancipation was one of the few periods in the year when slaves were able to enjoy themselves, free for a brief period from work. If they were lucky they received extra rations of food and possibly cloth or clothing for the coming year, as was the custom for servants in England. There were John Canoe processions, (variously written as Johnny Canoe, Junkanoo and Koo Koo, possibly from the French l’inconnu – the unknown- or perhaps of West African derivation) which are the origins of the modern carnival. 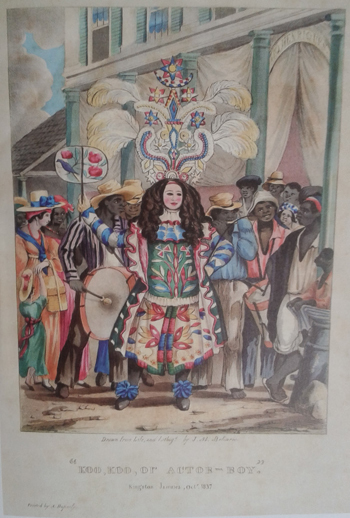 The two pictures shown here, painted by the artist Belisario and published in 1837, represent the actors who were competing for their costume and group of friends to be picked to lead the festivities. By this time the costumes were more elaborate, and less fearsome, than those described half a century earlier by Edward Long. In the towns, during Christmas holidays, they have several tall robust fellows dressed up in grotesque habits, and a pair of ox-horns on their head, sprouting from the top of a horrid sort of vizor, or mask, which about the mouth is rendered very terrific with large boar tusks. 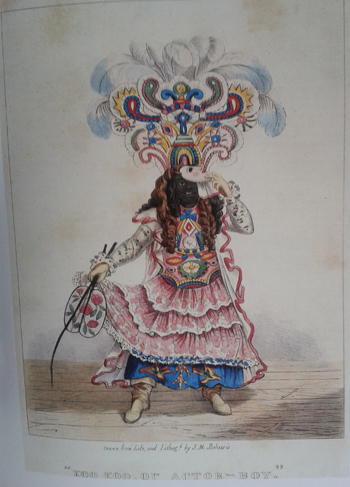 The masquerader, carrying a wooden sword in his hand, is followed with a numerous crowd of drunken women, who refresh him frequently with a sup of aniseed water, whilst he dances at every door, bellowing out John Connu! with great vehemence…this dance is probably an honourable memorial of John Conny, a celebrated cabocero at Tres Puntas, in Axim, on the Guiney coast; who flourished about the year 1720. There were also more local celebrations. On Christmas Eve 1812 the Moravian missionary John Becker wrote, Scarcely was our worship closed, before the heathen negroes on the estate began to beat their drums, to dance, and to sing, in a most outrageous manner. The noise lasted all night, and prevented us from falling asleep. The following day he wrote: After breakfast, I went down and begged the negroes to desist, but their answer was:’What, Massa, are we not to dance and make merry at Christmas. We always did so. ‘ I represented to them that this was not the way to celebrate the birth of our Saviour. and expressed my surprise, that having heard the word of God for so many years, they still continued their heathenish customs. But all I could say was in vain… (quoted in Braithwaite, The Development of Creole Society in Jamaica, pp.227-8). 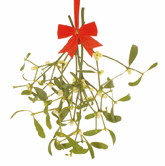 In England, since medieval times, masters had allowed their servants licence over the Christmas period to let off steam.There can be little doubt that the Christmas festivities for the slaves in Jamaica performed a similar function – the one time in the year when they were free to enjoy themselves as they chose, to sing and dance and eat, and for a brief period perhaps forget their situation. For those of you spending part of your Christmas holiday on family history research, you may like to know that the invaluable Jamaican Family Search website is now entirely free to use. Patricia Jackson, who set up the site fourteen years ago had always hoped to be able to make it free. Recently she wrote, “Those who have paid subscriptions in the past enabled me to purchase microfilms, microfiche, electronic images, or photocopies of documents and registers, not only from Jamaica but from archives or libraries in England and the United States. I spent thousands of hours transcribing information from them to put on the site, often working up to 50 hours a week (so much for a part-time job! ).” If you have not already discovered her site I can warmly recommend it. Also free and with many useful articles and website lists is Genealogy In Time Magazine. This site helps to fund itself by receiving small fees from Amazon if you click through from the links on their home page to purchase something on any one of the main Amazon sites. A recent article addresses the question of just how popular is genealogy and examines the statistics comparing internet traffic to the most popular sites and distinguishing between the occasional researcher and those of us who become obsessive! However you choose to spend the Christmas period, may I thank all of you who have been in touch or have bought my book, and wish everyone a very Happy Christmas and a peaceful New Year.